Dry. Fields, meadows, pastures, roadsides. Full or partial sun. This is a 1′ to 3′ tall, erect, annual to short-lived perennial forb that rises on multiple stems from a shallow, branching taproot. In the spring basal leaves form a rosette close to the ground. 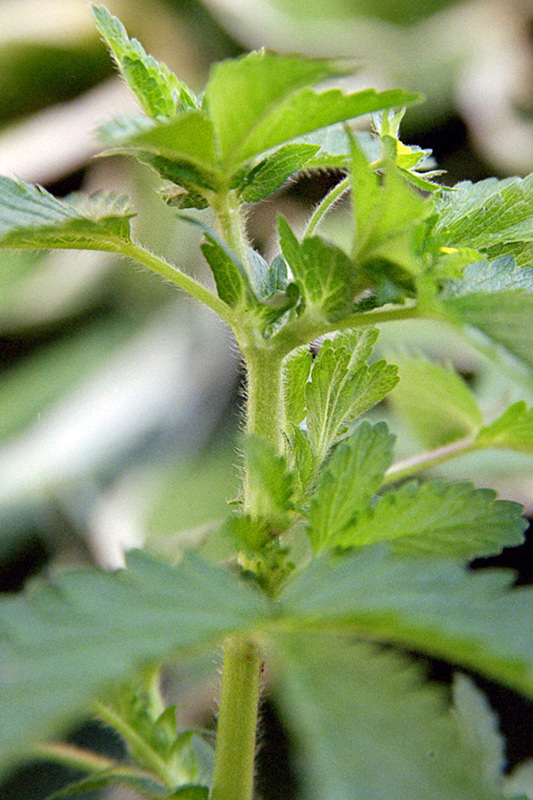 The stems are erect or spreading, stout, branching, leafy, and covered with coarse, stiff hairs. They are green when young, becoming dark red in strong sun. Basal leaves are on long, hairy stalks. The are divided into 3 leaflets. The leaflets are hairy, elliptic to egg-shaped, up to 2″ long and 1″ wide. The margins have coarse, rounded teeth around the entire margin, including near the base. The terminal leaflet is on a distinct stalk up to ¼″ long. 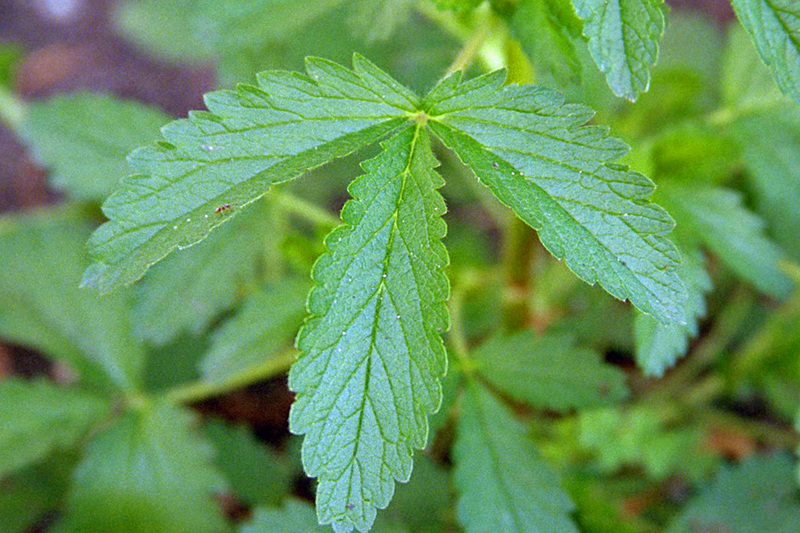 Stem leaves are similar to basal leaves, but are smaller and have shorter leaf stalks. They become smaller as they ascend the stem. The inflorescence is terminal clusters at the end of branches and individual flowers on short, hairy stalks arising from some of the leaf axils. The flowers are ⅓″ to ½″ wide. 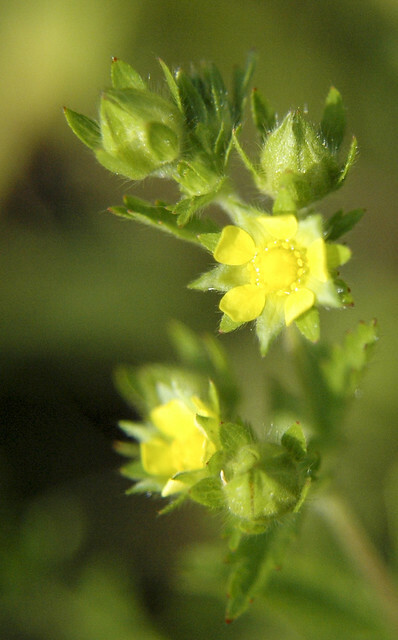 The 5 petals are yellow, rounded at the base, flattened at the broad tip, with a shallow notch at the tip.The 5 green sepals are longer than the petals and alternate with the petals. The 5 bractlets are dark green and about as long as the sepals when the flower is fully open. They alternate with the sepals and are visible below the petals when the flower is viewed from above. There are 10 to 20 yellow stamens. There is no floral scent. In the spring the plant forms a rosette close to the ground, which may be confused with common strawberry (Fragaria virginiana) or woodland strawberry (Fragaria vesca var. americana). 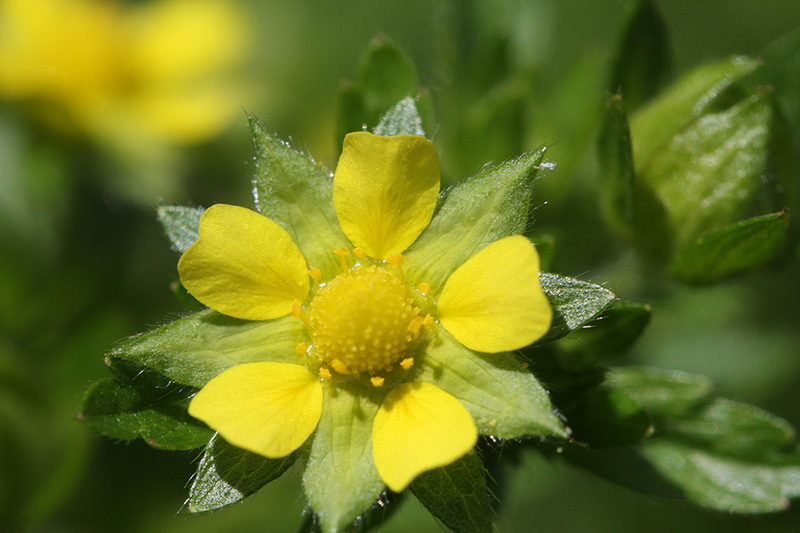 However, the leaves of rough cinquefoil tend to be toothed around the entire margin, while the leaves of the strawberries tend to be intoothed near the base. Both of the strawberries are low and prostrate on the ground when mature, and have white flowers. 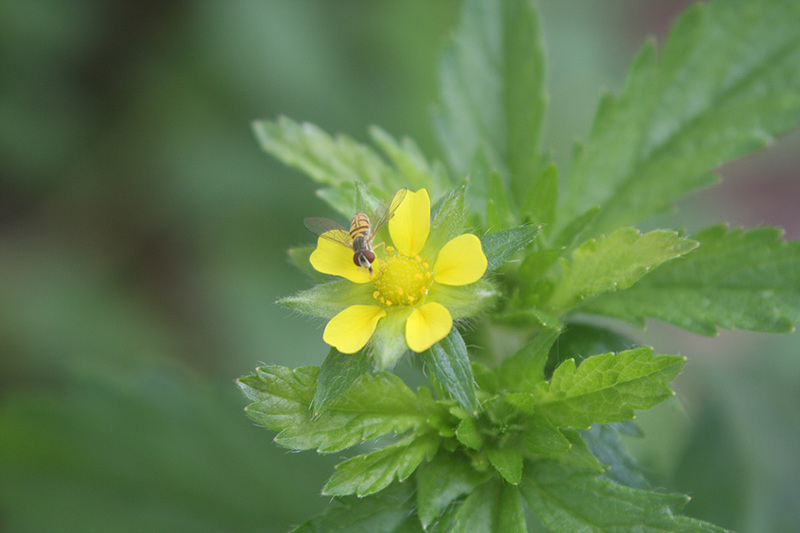 Rough-fruited cinquefoil (Potentilla recta) branches only above where the flower stems begin to appear. 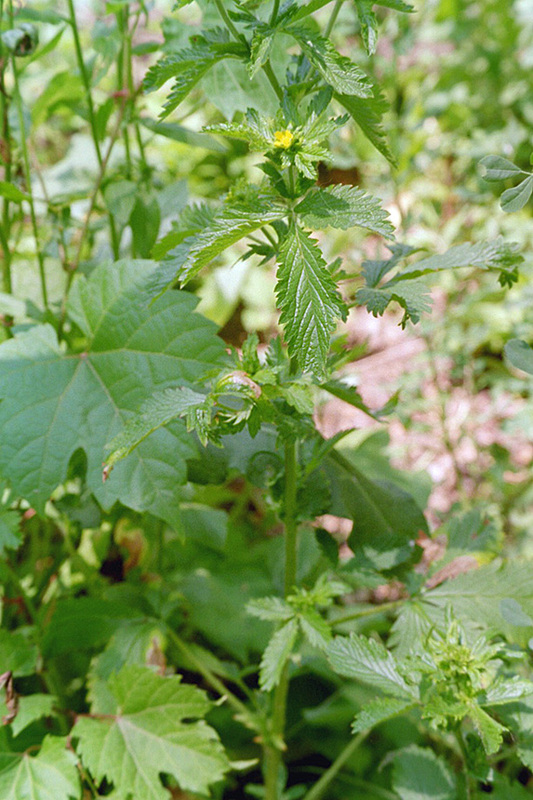 The flowers are pale yellow and larger. The flower petals are longer than the sepals between them. 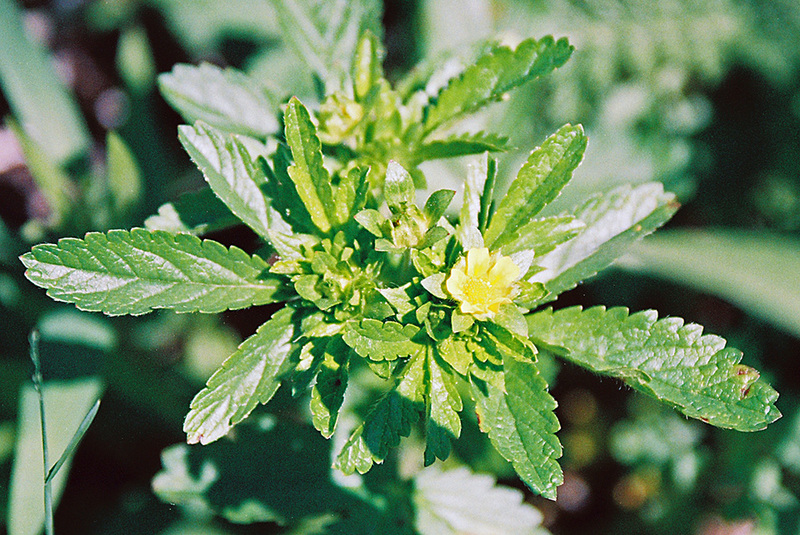 Silvery cinquefoil (Potentilla argentea var. argentea) has larger flowers. The leaves are distinctly lobed and are white and woolly underneath.